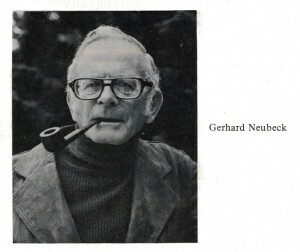 Gerhard (Gerry) Neubeck was a professor of family social science at the University of Minnesota. He served as the program chair of the 1974 joint NCFR-AAMFT conference in St. Louis, Missouri, and became NCFR’s 35th president in 1977. Until 1940, Neubeck lived in Germany, where he was a German-Jewish athlete. In the run-up to the 1936 Olympics, Adolf Hitler feared the United States wouldn’t allow its athletes to participate if Jews weren’t allowed to compete. So the Nazis put on a charade, allowing Jewish athletes like Neubeck, a runner, to train in a segregated Olympic facility. Days before the games, all were told they weren’t good enough to compete. In a July 17, 1996, Minneapolis Star Tribune newspaper article, Neubeck found a positive in the Nazi ruse. “It was an honor for me to at least have an acquaintance with an important event like the Olympics,” he said. His Olympic shoes and jersey are now a part of the Holocaust Museum in Washington, D. C.
On Nov. 9, 1938, Neubeck was beaten senseless by Nazi thugs. It was Kristallnacht, the infamous “Night of the Broken Glass” when Nazi storm troopers attacked thousands of Jewish businesses, synagogues and homes across Germany. The Neubecks’ apartment was demolished and his father was beaten as well. “You could have been killed at any time and nobody would know about it,” Neubeck said. Neubeck and his parents fled to the Netherlands, and then to the United States in 1940. In the United States, he earned a degree in personnel and guidance and a master’s in psychology. In 1946, he moved to the Minneapolis-St. Paul area, where he worked for a social service agency and as a University of Minnesota instructor. He earned a doctorate in education at New York’s Columbia University, returning to the University of Minnesota in 1953 as a marriage and student counselor. In the 1960s, Neubeck taught one of the nation’s first college courses on human sexuality and later wrote one of the first books on extramarital affairs. Neubeck retired from the U of M in the mid-1980s. In retirement, he enjoyed playing tennis and squash and riding his bicycle. His first home in the United States was in Brooklyn, and he remained a Dodgers fan. And he especially liked to write poetry for family and friends. Gerry died on Jan. 28, 2008, in his St. Paul home. His beloved wife, Ruth, supported Gerry in his career and often held NCFR board meetings in her kitchen in the early years. She continues to keep in touch with NCFR today with many interesting stories. She herself is a talented potter. Read more about Gerhard Neubeck.